Sea level rises caused by climate change will make tsunamis more common in the future, scientists have revealed. A sea-level rise of a mere 12 inches (30 cm) vastly increases the likelihood of the devastating natural disasters. Researchers found that the two are intrinsically linked, and warned that tsunamis could soon become far more common. This could lead to the death of thousands of people in the most vulnerable parts of the world, they warn. Experts from Virginia Tech University warned that previous 'absolute worst case' scenarios now appear to be 'modest' predictions. Rising sea levels already pose an enormous threat to coastal cities and communities around the world. The new research shows that it will become more common and reach more people in the future. 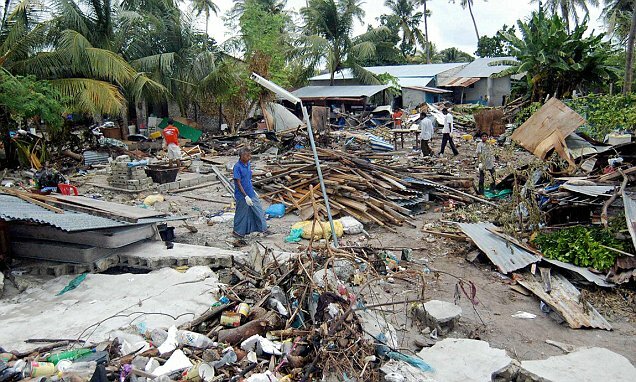 Floods caused by tsunamis will spread further inland than ever before as a result. The study, published in the journal Sciences Advances, involved scientists in Singapore, Taiwan and the United States. 'Our research shows that sea-level rise can significantly increase the tsunami hazard, which means that smaller tsunamis in the future can have the same adverse impacts as big tsunamis would today,' said Dr Robert Weiss, an associate professor of natural hazards at Virginia Tech who worked on the study. Dr Weiss and his colleagues created computer-simulated tsunamis for three different scenarios for the Chinese territory of Macau. These models used the current sea levels as well as looking at what would happen if they rose by 1.5 feet and three feet (0.5 and one metre). These increments were selected as scientists estimate that sea levels in the Macau region will increase by 1.5 feet by 2060 and three feet by 2100. They found that the frequency of tsunami-induced flooding by 1.2 to 2.4 times for the 1.5-foot increase and from 1.5 to 4.7 times for the three-foot increase.